It is easy to see how pyracantha got its common name, Firethorn. This shrub blazes with fiery berries in autumn and has very sharp thorns. For this reason, it is often used as a hedging plant to deter unwanted visitors from the garden. This is a great plant for adding some stunning colour to the garden as it will be smothered in berries from September to February. It also features masses of white flowers in late spring and early summer. The shrub is evergreen so provides good structure and colour to the garden in all seasons. This shrub can be grown as a specimen plant, trained up a fence or wall or used as hedging. It can also be planted in a large container. 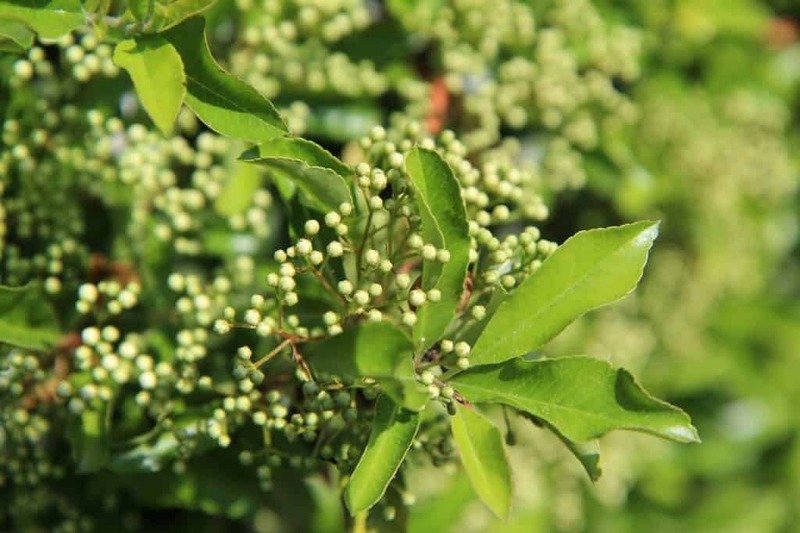 Bees will love the flowers of your pyracantha and birds may like to nest in it, as the thorns keep them safe from predators and the berries provide a steady supply or winter food. These plants can tolerate very cold temperatures in winter and very hot ones in summer which makes them virtually indestructible. They are also easy to grow and require little maintenance. Regular pruning can keep your plant looking its best. Read on to find out how to choose and grow this plant and for advice on planting, propagating and taking care of it. Can reach a height of 4 metres (13 feet) however, it can be kept to a smaller size with regular pruning. Pyracantha leaf-mining moth and woolly aphid pests. 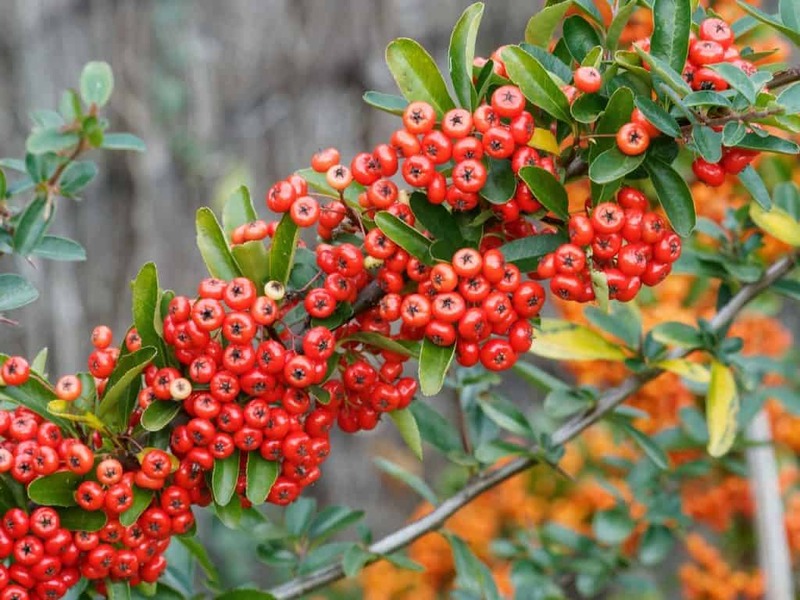 All pyracantha are large shrubs that require little maintenance. They can, however, be pruned to keep them to a smaller size if required. They produce white flowers in May and June and have abundant berries in autumn. Some varieties are better for hedging and some for training on walls or fences. In addition, some tolerate shade better than others so choose your variety carefully depending on your conditions and what you want from your plant. This shrub can sometimes be affected by fireblight and scab, however, newer varieties have been bred to be resistant to these diseases. Look for varieties in the Saphyr series which include ‘Cadrou’ (orange-red berries), ‘Cadange’ (orange berries) and ‘Caduane’ (yellow berries). 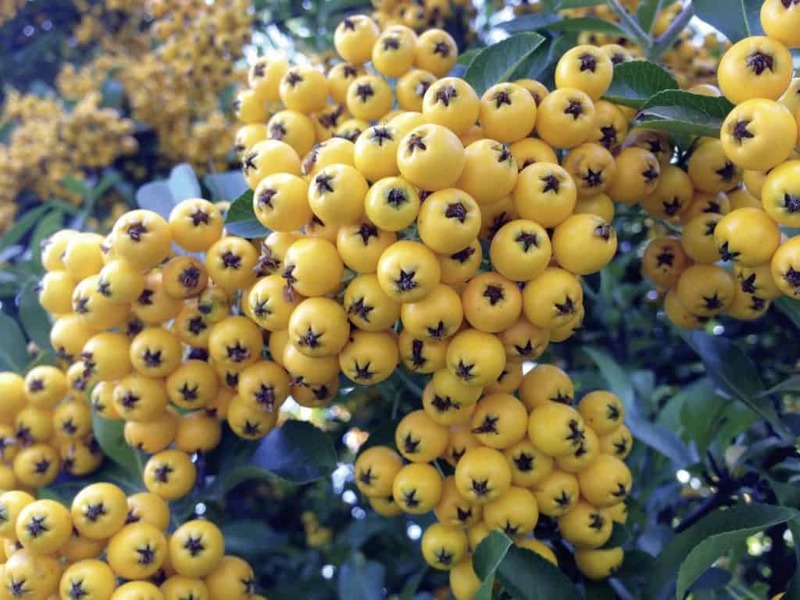 This variety has bright yellow berries that birds love. It grows best in well-drained soil and can tolerate partial shade. It reaches a height of 3 metres (10 feet) but can be kept smaller by pruning. It can be used as a hedging plant, as a specimen shrub or it can be trained against a wall. This variety has bright red berries. When used as hedging it provides a good, dense, prickly hedge. It can also be trained against a wall, fence or trellis. It will tolerate a position in partial shade. This is a fast-growing shrub that will reach a maximum height of 3 metres (10 feet), but it can be pruned to whatever size required. This variety has orangey-red berries and prefers full sun to partial shade. It is very resistant to diseases such as fireblight and scab. It reaches a maximum height of 3 metres (10 feet). This variety is smaller with a compact spreading habit. It can reach 1.8 metres (6 feet) tall, but if well pruned can be used to provide ground cover. It has orange-red berries. This variety could also be grown in a large container. This variety is a vigorous upright plant that has some resistance to scab. It can be grown against a wall or used as a free-standing shrub. It has orange-yellow berries. It can reach a height of 4 metres (13 feet). This variety has unusual purple-black stems that contrast stunningly with the orange-red fruits. It is a medium-sized variety reaching 2.7 metres (9 feet) in height. It can be pruned to keep it to a smaller size. These shrubs are very hardy and easy to care for. Once established they will give you years of trouble-free pleasure. Pyracantha like plenty of sunshine if they are to flower well and thus produce abundant berries. Many types will tolerate partial shade, however. Generally, as long as they get a few hours of sunlight each day they will be fine. This plant is very deep-rooted which makes it drought hardy. Once established it will not usually need watering. The only exception is if it is grown against a wall where it might not get all the moisture it needs. In this case, it should be given a thorough watering, weekly, in dry conditions. It is more important to ensure that your plant does not become waterlogged as this can cause roots to rot. Plant it in free draining soil and add plenty of coarse grit if the soil is at all heavy. These shrubs prefer fertile well-drained soil; however, they will tolerate most soils. If you are planting in clay, add lots of coarse grit and well-rotted compost and choose a fairly well-established plant as they will cope with wet soil better than immature plants. If you have poor soil, apply blood fish and bone or other fertiliser in spring and autumn. The best time to plant this shrub is spring or autumn. If you are planting against a wall or building, make sure your shrub is at least 20 inches from the foundations. This will give its roots room as well as ensuring it is not kept dry by gutters or overhanging rooves. It is best not to plant these shrubs at the corner of two fences or walls as this will limit air circulation and could lead to fungal diseases. Dig a hole twice the size of the rootball. Add a handful of blood, fish and bone or other organic fertiliser and work it in a little. Situate the rootball so that it is at the same depth as it was in the pot, backfill and firm in. Water well to settle the roots and remove any air pockets. If you are planting a pyracantha hedge you should position the plants at 60 cm (2 feet) intervals. Once planted, a layer of mulch should be applied to suppress weeds and retain moisture as well as providing nutrients as it rots down. Keep the mulch a few centimetres clear of the stem so that it does not stay moist and begin to rot. These plants do best if planted in the soil and are not always happy in a container. If you do plant one in a container it is best to choose a smaller, variegated variety and plant in a nice big pot. You can keep the plant compact by regular pruning. These plants require very little maintenance. However, they are large shrubs, so a good pruning regime will keep them looking their best and keep them the size that you require. In addition, it is advisable to remove and destroy fallen leaves in autumn to reduce the risk of fungal infections. Container grown plants will need regular watering and feeding. A good pruning routine will help maintain a nice shrub to the size that you desire. In addition, proper pruning ensures plenty of air circulation and reduce the chance of fungal diseases. In the first two or three years, your shrub will be establishing its structure and root system so will not need pruning. Simply cut away any dead or dying stems. Remember to wear good, thick gloves to protect you from your shrubs thorns. Pyracantha is easy to prune as you can tell where the berries will be by where it has flowers. So, by pruning when it is in flower you can easily see which stems to leave so you don’t lose berries. When it is in flower you will easily be able to tell the old growth that is not flowering anymore. You do not want to remove all of this growth however as it is still adding to the structure of the shrub and providing nice evergreen foliage. Generally, it is best to cut back one third to half of these non-flowering stems. It is also advisable to thin out some of the stems to allow good air circulation. Cut back about one in five of the oldest stems within the crown of the shrub. You can also trim up any over long or weak stems to create a nice balanced shape to your shrub. If you have an overgrown pyracantha it will withstand quite hard pruning. You can cut the whole shrub back by half without any long-term ill effects. You may have fewer berries in the following year but in time the plant will come back better than ever after its regeneration. It is easy to create new pyracantha plants by taking cuttings. This should be done in late spring or early summer, though they can be taken right up to autumn if necessary. Prepare a pot for each cutting using a mixture of potting compost and sand or horticultural grit to create good drainage. Make a hole for each cutting using a pencil. Choose stems that are just beginning to go woody at the base. Pinch out the soft tip of the stem. The stem can then be divided into cuttings. The base of each cutting should be cut just above a leaf node as this is where the plant will create new roots. Each cutting should be 7-15 cm (3-6 inches) long. Remove the lower leaves. You can dip your stem in hormone rooting powder as this will encourage rooting and help prevent the cutting from rotting. Insert each cutting into its pot and mist generously with water. Cover each pot with a plastic bag secured with an elastic band and place them in a warm sheltered spot in good light but out of direct sunlight. Check your cuttings weekly. At this time, you should give them an airing for at least ten minutes, remove any dead or dying material and water them. Your cuttings should produce roots in a few weeks at which time you can remove the plastic bag. Keep watering them regularly and will be ready for planting out the following spring. These shrubs are not generally susceptible to pests; however, they can occasionally be attacked by the Pyracantha leaf-mining moth or woolly aphid pests. The larvae of this moth feed inside the foliage causing a silvery-white discolouration to the upper surface of the leaves. The caterpillars of the moth make a mine along the central leaf vein. Once it has finished feeding, it spins silk webbing within the mine which causes the leaf to fold upwards. This moth can make your plant look unhealthy, but it does not actually damage the plant much. This seems to be a problem in some years more than others. New growth will be healthy so generally, no treatment is required. Woolly aphids are sap-sucking pests that feed on your plant. They are tiny and usually a green or blue colour. They are covered with a white, waxy material that makes them look ‘woolly’. They can cause twisted and curled leaves, yellowing foliage and poor growth. Some stems may even die back completely. You may also see a sticky residue known as honeydew. These pests rarely do significant damage to the plant; however, they can make it look unsightly. An application of insecticidal soap or neem oil may get rid of them, however, usually, they are kept in check by predators such as lacewings, ladybirds and parasitic wasps. This is a fungal disease that can cause black marks on the leaves and berries. It usually occurs in summer but may not be noticeable in the first year. However, when the infected leaves fall in autumn the fungus spores survive overwinter. Then, in the following spring, spores are released from the fallen leaves and spread to the new leaves through wind and watering. In order to prevent this disease, it is advisable to remove and destroy all fallen leaves in winter. Many varieties are now resistant to scab. Fireblight is a disease caused by the bacterium Erminia amylovora. If affected your pyracantha’s leaves start to turn black and look cracked as if they have been burnt by fire, which is what gives the disease its name. The symptoms also include flowers that wilt and die, shoots that shrivel, a slimy white liquid oozing from infections and cankers where infected shoots join larger branches. Infected parts of the plant should be removed and destroyed. Cut the plant back to healthy wood. Remember to disinfect your pruning tools after each cut to avoid spreading the disease. Q My firethorn has not produced any berries this year. What could be wrong? There are several possible reasons for your plant’s lack of berries. If your plant generally produces berries, then it is likely that it is weather conditions that have affected your plant. If your shrub did not get enough water this can cause the berries not to develop. This can be a problem in a dry, sunny border or in a plant that is against a wall or building. Late spring frosts can damage the flowers, resulting in no berry production. Also, the flowers require pollination in order to produce berries. If the plant flowers when the weather is cold and wet, bees and other pollinating insects will not be active and this can result in a lack of berries. If your plant failed due to weather conditions this year, then hopefully it will do better next year. However, it is worth checking your plant for pests and diseases to make sure there is not a more serious underlying factor. Q The leaves on my pyracantha have turned yellow. What can I do to get it back to good health? If it is the older leaves of your plant that are turning yellow it may have been affected by Fusarium wilt. Prune out and destroy any affected parts of the plant. In addition, check that drainage and air circulation are good. If it is the new leaves that are affected it indicates a mineral deficiency. This can be caused by overwatering or waterlogged soil. I would suggest that you reduce watering and apply a slow release, organic fertiliser in spring to see if this sorts the problem out. Q I planted a pyracantha hedge two years ago, but it hasn’t had a single berry. What could be wrong? As these plants are still quite young, I think it is just that they are not mature enough to produce flowers and berries yet. Give it another year and you will probably begin to see some as long as the hedge gets enough sun and is not waterlogged.